This is a single stereo power amplifier using the powerful 6L6GC. Assembly is easy. Anyone can follow the printed circuit board and obtain the same result. For this reason, you do not need to know the details of wiring and other technical details to assemble a vacuum tube. This amplifier is compact and powerful enough to surpass the capacity of output transformer in other models under the same class of our company (TU-877, 874, etc.). 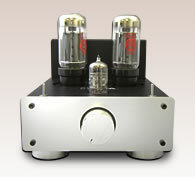 This amplifier includes premium capacitors which enhance the sound quality. 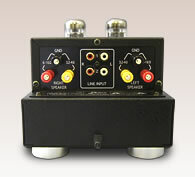 This amplifier installed with advanced "R-core transformer" as a power transformer that enables clear tone quality. To improve transient characteristics, both polypropylene film capacitor act as a coupling capacitor (previous model: polyester film) and low-ESR electrolytic capacitor are adopted in TU-879S. The highest S/N ratio among our models thanks to large reduction of ham-noise. The ripple filter used with π-MOS FET in our higher end models is improved. The driver tube heater is powered from a DC supply with a 2mm thick shielded panel added to effectively reduce hum noise to the minimum. A number of other components have also been upgraded.